Our first project with A Glimmer of Hope will be to fund a well as part of their 2018 program in the Villages of Gondar, a rural area in the Amhara region of northwest Ethiopia. It will serve 249 people in the region with much needed access to safe, clean drinking water. Access to safe drinking water is a huge challenge for the people of Ethiopia, particularly in rural areas like Gondar. According to water.org, 61 million Ethiopians lack access to safe drinking water. As a result, many women and children are forced to walk for hours a day to collect water for their families. Water that is often contaminated and risks spreading disease to both their families and livestock. Our well with Glimmer, ‘Charlie’s Watering Hole’, will help to break this terrible cycle for the people of Gondar. Every dollar we donate will go directly to this life saving project. 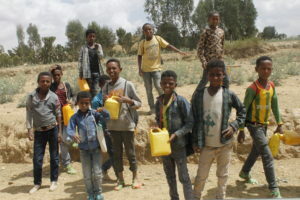 ‘Charlie’s Watering Hole’ is part of a larger program that focuses on providing water, education, health and livelihood needs for the people of Gondar. The average cycle of a program with Glimmer, from start to completion, is between 12-18 months. Within this time, our well will be constructed and a local water committee will be selected. This committee will be trained on how to manage, maintain and monitor the project, including collecting dues and generating savings as part of their sustainability strategy. Their training includes a thorough hygiene and sanitation component. Glimmer is fighting poverty in rural Ethiopia with an holistic approach to change. Their projects create a network of resilience that holds up thriving communities and empowers women and girls as leaders. Glimmer applies 100% of donations directly to projects in rural Ethiopia—creating a high return on every dollar invested. With 18 years on the ground, Glimmer has completed 10,000 projects and impacted the lives of 5 million people in rural Ethiopia.